Steve Guttenberg is that rare actor - the one who knows his range, and pretty much stays within it. He's a light comedy kind of guy. That's right. 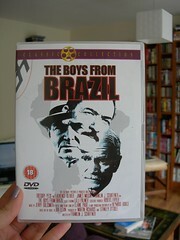 It's 1978's Boys From Brazil, costarring Gregory Peck and Sir Laurence Olivier. Oh yes. You read that right. Two Oscar winners, Nazi scientists, Nazi hunters and South America. And Steve Guttenberg. Or, as he's named in the credits "Steven Guttenberg". Clearly a drama this serious and important has no room for Steves. It's the story of a Jewish Nazi hunter, Ezra Lieberman(Olivier), living in South America who spends most of his time tracking down rogue Nazis. Steve is an enthusiastic youngster who is an amateur Nazi hunter, and is tracking down Dr. Josef Mengele (Peck) who is up to various dastardly deeds. Lieberman tries to discourage Steve from his Nazi hunting, but does Steve listen? Of course not! He's Steve Guttenberg! He's enthusiastic and dedicated! And, of course, he gets killed for his trouble. About 25 minutes into the movie. But don't let that stop you from watching this - despite it's rampant Guttenberg killing, this is not a bad movie. Mengele is trying to create a new Hitler, from 95 Hitler clones growing up around the world. The Hitler 2's are about 12 or 13 years old and Mengele is killing off their fathers because Hitler's dad died when he was that age. Lieberman finds out about the plot thanks to the good work of dead Steve Guttenberg, and tries to stop it. He and Mengele have a dramatic fight in the house of one of the Hitler 2's and Lieberman makes the dramatic decision not to have the Hitler clones killed. A LOT of time is spent explaining cloning, which was clearly necessary in 1978 but is a bit "Cloning? We get it. Shut up already." in 2006. Anyway, for the only real drama in the Guttenberg filmography, it's good stuff.